Kennedy wanted a Fairy Party, I didn't want to go with the typical fairy garden theme. I know how much she loves the outdoors and animals and so it began. I started gutting out our woods on the side of our house and made her and Enchanted forest. I thought of this idea because when I was little my family would take us to this spot in town "The Enchanted forest" and it was so magical to me and was one of my favorite memories growing up. So much stuff to do there and see bowling pins made out of wood, houses, tables, Little men made out of wood, trails you name it. So back to Kennedy's party I went with an Enchanted forest fairy and gnome Party. I wanted it to feel whimsical, magical, enchanting, majestic. Something she and her cousins and friends could play in after her party and many years to come. I started working on the woods when there was still mounds of snow everywhere,(we live in Maine) I had a time limit to get this done before her party came along. So I brought out the shovels and starting digging. The area I chose on the side of the house was just perfect, the trees seem to spread out just perfect soo I found the trails I wanted to add and started cutting with a saw and machete (which took forever) and tipping over the dead trees and hauling them out. Thank goodness Kennedy's papa came along with the chain saw and it HELPED out in a big way! So finally we got the trees cleared out, I began lining the trails with Rocks , which took A LOT of Rocks to do and took a lot of grunting and groaning trying to push this wheelbarrow through the woods up the trails filled with a ton of rocks. (Gets super heavy). Once that was completed my father's friend had given him a pretty nice wooden swing set for Kennedy awhile ago. That wasn't put together yet, so I had him take the Slide and put it in the forest. Same with the swings and the Rock climbing wall. I spread them out amongst the trails. Parts from the swing set I used to make bridges for the trails and also made a tent out of spare pieces. His friend also gave us a nice sandbox that his grand daughter outgrew. So in the sandbox went in to the forest (which is a big hit with he kiddos). I had the perfect spot near the end of the trail, it came to a complete straight line so I went and purchased large outdoor bowling pins and put them in, it opened up at the end of the trail for the perfect spot. Kennedy's papa, myself and her Nana worked on a house to put in the forest. It turned out awesome, big and looks like a log cabin just tied in perfect with the theme. I ended up gettting a bunch of brick and painted yellow lines on them and made a big racetrack for forest and found some PVC lying around and made a tunnel out of it and covered it with mulch, rocks, and moss and that's where the cars went flying down and you could race on the track. I found some trees and hung them connecting to two other tree so I could hang the flower reading canopy I made. I added tons of Toadstools, Flowers, gnomes, Butterflies and pinwheels throughout the trails. I also Made Fairy doors and windows and nailed them to trees. So that sums of the Forest pretty well. For the tables I had the perfect spot picked out for a large long table for the kids, in front of these large rocks and super old logs that were growing moss all over them and it just added perfectly to my theme I was going for! We made a long table out of plywood and used stumps for the legs and made log benches for seating and I Made toadstool pillows to place on them. I used the main kids table for them to make fairy gardens and remember those large rocks and stumps I put all the accessories for the gardens all over them so the kids could go over and pick what they wanted to put in their gardens. The middle of the table was decor of moss,gnomes,trolls, fairies, rocks, butterflies, birds, flowers, wood, birds nest, fairy homes and animals etcs.... I had a spot right by the main table to put up a fairy swing, I made the wooden board and covered it with moss and on the rope added flower garlands. I placed a table by the main table that was set up with fairy wands and headbands I made for the girls and Gnome hats and beards for the boys. I had a section laid out for face painting and Fairy hairspray glitter. I had this perfect round mirror that was made out of bark that went perfect right next to the table and I hung fairy wings I made next to that so They all could check themselves out all dolled up before they entered the forest. I made three toadstool tables from Spools. I set up little crafts the kids could make on them. I hung from the entrance Her name I made out of twigs moss and flowers for each letter. The hanging decor I used were pom poms I already made that I used at one time for her nursery and I made yarn balls out of balloons and hung flower pots covered in moss. The food table was over by the end of the trail to exit the forest, near a wishing well we already had on the property and I felt that tied in perfect with the theme. My inspiration for this project was an Enchanted forest, fairies gnomes and animals. Flowers were a huge huge part I wanted it very colorful in the woods and feel magical. Glitter and tons of ribbons. My decorating style i would have to say was making most of the stuff. I added TONS of flowers and butterflies to everything while also wanting to leave the woodsy feel to it all. Forest animals. (which is funny there are three wild Rabbits that we watch everyday roam throughout the trails) I wanted to keep my design style to a very low budget. I wanted to add a lot of color, Ribbon, glitter, moss. I used a lot of bark twigs, wood stumps. I used many stuff I already had from hair shows etc. 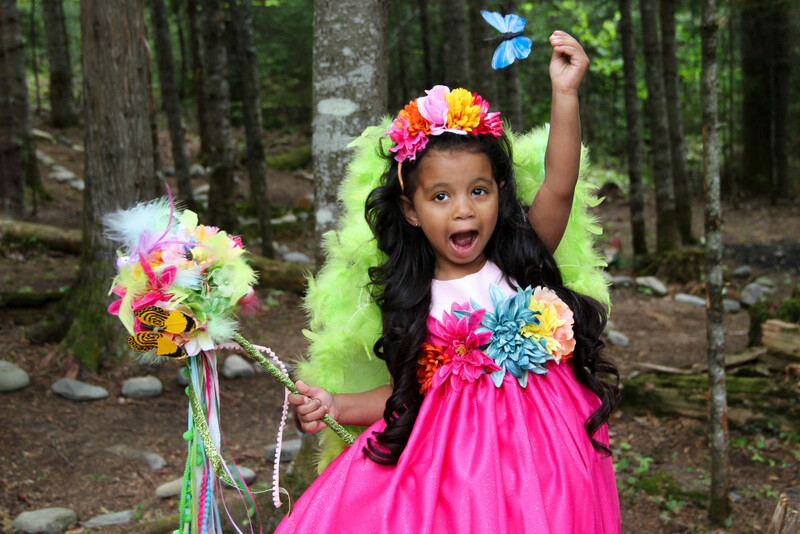 I made her birthday dress, all the fairy wings and gnome hats wands, signs, hanging yarn balls. I made the Flower canopy out of a hoola hoop curtains I already had and flowers and tulle I already had laying around. I made her Kennedy letters out of Twigs, moss, and flowers on cardboard letters and hung with twine. I made signs that I glued on sticks I stuck in the ground for each entrance to the station they were at. It was a free fairy printable I found on the internet and I rimed the signs with twigs and added a lot of ribbon. I picked up three free wooden electrical spools and painted them into toadstools. All the Toadstools throughout the forest were made out of plastic bowls from the dollar tree that I flipped over and painted white spots on them. The playhouse was made out of free wood that was given to us. The fairy dust labels came from Etsy Heaven in rage shop. The invitations and food labels came from Etsy Paper & pigtails shop.Large outdoor Bowling pins came from Walmart same with the Large Gnome. The pinwheels and fairy rocks in the forest came from the Dollar tree. A lot of the moss came from Hobby Lobby, Joann's Fabric and Marshall's for the Moss balls and tiered rocks. I went to some yard sales for frogs and etc for the forest, and was given a lot of the gnomes that went in the woods from Kennedy's MiMi. I had my father cut a bunch of round wood plates for the main table and also tiny ones I put in a little hook and twine as a necklace for the kids to decorate. I printed off free printable coloring pages for them to color of gnomes and fairies. My favorite items were the Toadstool spools, the Fairy swing and wings, headbands, wands and gnome hats. The flower canopy, Playhouse. The table made out of stumps and seating. The toadstool pillows. The cupcake and food stands I made out of stumps. A crafty DIYer mommy to sweet Kennedy.